Eureka is the principal city and county seat of Humboldt County in the Redwood Empire region of California. You've now added Old Town Eureka to your itinerary. Kick off your visit on the 27th (Wed): don't miss a visit to Trinidad Memorial Lighthouse, then make a trip to Old Town Eureka, and then explore the different monuments and memorials at Ferndale Historic Cemetery. Keep things going the next day: see the interesting displays at Chapman's Gem & Mineral Shop & Museum, take an in-depth tour of Ferndale Museum, and then kick back and relax at College Cove. To find ratings, where to stay, reviews, and more tourist information, refer to the Eureka itinerary maker. San Francisco to Eureka is an approximately 4-hour combination of flight and bus. You can also drive; or take a bus. Traveling from San Francisco in September, expect Eureka to be little chillier, temps between 64°F and 51°F. Finish your sightseeing early on the 29th (Fri) to allow enough time to travel to Weott. Weott is a census-designated place in Humboldt County, California. Start off your visit on the 29th (Fri): get outside with Founders Grove and then kick back and relax at Black Sands Beach. Get ready for a full day of sightseeing on the 30th (Sat): learn about winemaking at Briceland Vineyards Winery, then cruise along Humboldt Redwoods State Park, and then explore and take pictures at Lost Coast Scenic Drive. To find where to stay, photos, maps, and other tourist information, read our Weott sightseeing planner. Getting from Eureka to Weott by car takes about an hour. In September, daytime highs in Weott are 69°F, while nighttime lows are 52°F. Finish up your sightseeing early on the 1st (Sun) so you can travel to Fort Bragg. 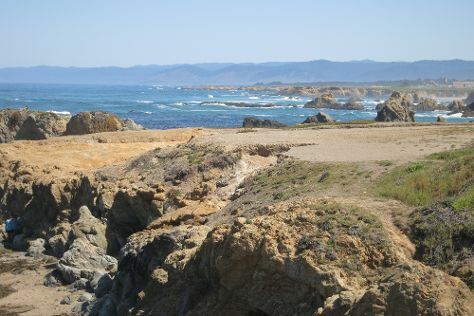 Fort Bragg is a coastal city along State Route 1 in Mendocino County, California. Your day-by-day itinerary now includes Glass Beach as well as Skunk Train. Kick off your visit on the 1st (Sun): enjoy the sand and surf at Noyo Headlands Park, then look for all kinds of wild species at Jug Handle State Reserve, and then contemplate the waterfront views at Big River. Keep things going the next day: tour the old-fashioned way with Skunk Train, then examine the collection at Guest House Museum, and then enjoy the sand and surf at Glass Beach. To see maps, photos, ratings, and more tourist information, read our Fort Bragg trip planner. You can drive from Weott to Fort Bragg in 2.5 hours. Traveling from Weott in October, expect nights in Fort Bragg to be about the same, around 45°F, while days are somewhat warmer, around 77°F. Wrap up your sightseeing on the 3rd (Tue) early enough to drive to San Francisco. Your inner history buff will appreciate Castello di Amorosa and Twin Peaks. Satisfy your inner culture vulture at Alcatraz Island and Pride Mountain Vineyards. Change things up with these side-trips from San Francisco: Gracianna Winery (in Healdsburg), Muir Woods National Monument (in Mill Valley) and V. Sattui (in St. Helena). The adventure continues: contemplate the waterfront views at San Francisco Bay, snap pictures at Golden Gate Bridge, wander the streets of Fisherman's Wharf, and get curious at Exploratorium. To find photos, traveler tips, and tourist information, read San Francisco itinerary maker. Traveling by car from Fort Bragg to San Francisco takes 3.5 hours. Alternatively, you can do a combination of bus and flight. Traveling from Fort Bragg in October, expect a bit warmer with lows of 56°F in San Francisco. Finish your sightseeing early on the 7th (Sat) to allow enough time to travel back home.